I’m late for a meeting, and I’m sitting in traffic. Might as well use that time productively, I figure, so I grab my smartphone, open an app and start swiping. Too old. Swipe left. Never married. Nope, swipe left. Spelling errors. A definite no. Then I see him. Handsome, tall, well-educated, professional, lives close by. Swipe right. This is my life, now that I’ve re-joined the singles scene for the first time in more decades than I care to discuss — involuntarily, I might add, since my husband passed away suddenly two years ago. And, since I work at home and don’t have the opportunity to meet many people in person, I’m now searching for the man of my dreams online and through the use of smartphone apps with names like Bumble, Hinge, OK Cupid and Coffee Meets Bagel. There are scores more too, such as the better-known Match, Zoosk, Plenty of Fish, eHarmony and Tinder. Check out any of these sites or apps, and you’ll soon realize there are indeed plenty of fish in the online sea. But I haven’t caught mine, yet. Many men over 50 are looking for younger women. Just check the profiles on any dating site, and you’ll see this in action. And, down here especially, many men over 50 (and certainly most over 60) are retired, which creates a problem for someone like me, who still works full-time and has no plans to retire any time soon (at least until I’m eligible for Medicare). After all, I can’t travel on a whim, play pickleball during the afternoon or enjoy extended lunches at the club at this point in my life. 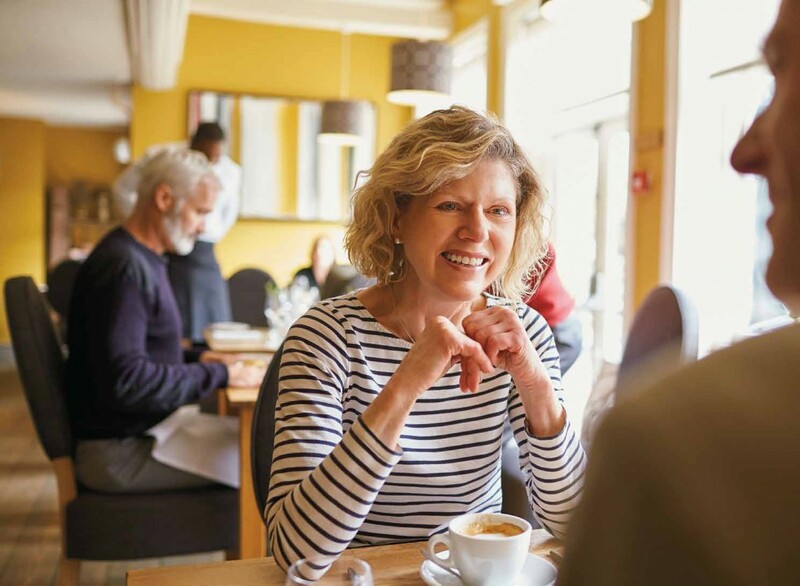 Another challenge for the over-50 dater: Women have changed. We’re independent, financially stable and, well, kind of picky. We’re not willing to settle. Let’s go back to that handsome, well-educated man I found on Jdate, a popular Jewish dating site. I sent him a message, he replied — after all, Jdate said we were a 98 percent match — and then we spoke on the phone and met for lunch at a waterfront restaurant in Boynton Beach. The date was going well — so well he asked me out again as we walked to our cars afterward. And then I uttered the words I would come to regret. “My dogs will be happy to see me when I get home,” I said. “I HATE dogs,” he said. So that was my first and last date with the physicist who had seemed so promising. I didn’t even know there was a gun manufacturer in South Florida. I learned later that Florida has many. It turned out he had a gun safe in his apartment, owned several weapons, including some scary ones, and did in fact go hunting. So I joined the other women he had dated and got up and left. Technology can present a challenge for some older daters as well, if they haven’t kept up with texting, chatting and apps like FaceTime or Skype. But online dating also makes it easier for people to start conversations when they might not feel comfortable approaching someone in a bar, Murray says. Despite its challenges, however, online dating works. I personally know four couples living in South Florida who met on Jdate and ultimately got married. That includes two Millennial couples and two successful South Florida female business owners. It’s important to keep your expectations realistic. I’m not looking for something that doesn’t exist. Here are the criteria for the man I’m seeking: smart, funny, kind. If he has hair, is taller than I am and likes dogs, that’s icing on the cake. Yet he remains elusive. I figure it’s just a matter of being in the right place at the right time. I need to be on the dating site at the same time he is or my intended and I will never meet, even virtually. But online daters need to be careful. There are a lot — a LOT — of scammers out there. When I checked the Coffee Meets Bagel app recently, I matched with three model-quality men, all of whom purported to be Norwegian petroleum engineers working in Miami. Now, exactly how many petroleum engineers work in Miami, an area not especially known for its oil and gas industry? These were fake profiles. I reported them and moved on. The FTC said that reports to the FBI about online romance scams tripled between 2012 and 2016, and imposter scams were among the top reports to the FTC for both the general population and the military community. Apparently, many imposters even steal service members’ photos to create phony profiles. So, how can you protect yourself? The FTC advisory says to be wary of those who try to rush you, profess love right away or pressure you to move your conversation off the dating site. And, of course, don’t send money or gift cards to someone you meet online. Some online daters even use “pen names” to protect themselves. I know someone who used her middle name on Jdate until she actually felt comfortable enough to meet her dates in person. That’s not a bad idea, especially if you are a business person with a substantial social media presence. I include as few details as possible on my profiles and despite that, I still had a bad experience with someone who did a reverse-image search on my profile picture, found my Facebook page and started sending me creepy messages. Now I use a unique photo for my dating profile that isn’t used anywhere else. Florida also makes it easy to check out people you meet online. Public records and court records are online here, so if you have someone’s name, you can find out lots of information, such as whether that person has been the subject of a foreclosure or bankruptcy, has federal tax liens or a criminal record and how many times they’ve been divorced in this state. Google will also bring up useful information, whether you search by name or telephone number. You can even find voter registration records online that tell you what political party that person belongs to, if that matters to you. Meet in a public place where there are lots of people. Make sure a friend or family member knows where you are going and with whom. Drive yourself to that first meeting — and to as many subsequent dates as necessary until you trust that individual. As for me, I’m taking a hiatus from dating at this point. I’m not entirely certain that the person for me is here in South Florida. And I’ve also found that online dating isn’t all it’s cracked up to be. Yes, it certainly has advantages, particularly for a person who works at home, but it also allows you to eliminate people somewhat arbitrarily — because they’re too short or a year or two above your age limit, for example — whereas in person, if you got to know that individual, you might be attracted to them anyway. So, we’ll see what happens. And, in the meantime, if you happen to know someone who might be right for me, well, you know where to find me.